Rolling across the landscape in abundant golden rows, it is easy to forget that wheat is not just a symbol of plenty, but one of the crops upon which we are most dependent. 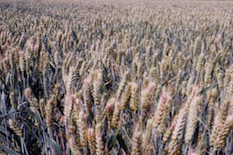 However like all plants, wheat cannot thrive in just any condition. Drought, disease, pests, and other factors can destroy a crop in the blink of an eye. For this reason, a new variety of soft red winter wheat has been invented at the University of Maryland (UMD) to stand strong against multiple threats and provide us with the perfect baking flour for our favorite pastries. UMD Department of Plant Sciences and Landscape Architecture (PSLA) researchers Professor Emeritus Dr. Jose M. Costa, Cutfresh Organics CEO Aaron R. Cooper, and Benjamin Conway, have developed a commercially useful soft red winter wheat variety by crossing and selection in UMD’s College Park greenhouses. This invention has been supported by the United States Department of Agriculture (USDA) U.S. Wheat and Barley Scab Initiative, and Maryland Crop Improvement Association grants. Testing procedures have proven this variety of wheat to be very promising. Not only have these tests shown the wheat to have high grain yield, high test weight, and high flour yield, but the crop also displays a hardy resistance to mildew and multiple diseases, including the particularly devastating Fusarium Head Scab, which is typically caused by the fungus Fusarium graminearum. These attributes also make the wheat ideal for making baked goods, such as cakes and muffins. Dr. Costa and his fellow researchers are eager to see large seed sales of the wheat variety. “Already, it has been bought by the private seed company Limagrain for seed distribution in the U.S.,” said Costa. For the future, they hope to see their new variety being used by soft red winter wheat growers and other breeders.